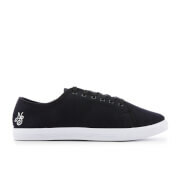 Men’s ‘Vision Mix’ pumps from Jack & Jones. Crafted from blue chambray canvas, the trainers comprise a rounded toe and a lace up fastening with metal eyelets and contrasting brown laces. 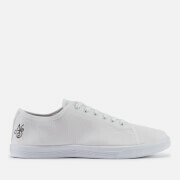 Placed upon a textured rubber sole, the sneakers are complete with a leather look patch to the rear, a woven heel pull and Jack & Jones branding.